According to FactSet, 52 companies in the S&P 500 have issued negative EPS guidance and 53 companies in the S&P 500 have issued positive EPS guidance. While this sounds quite balanced, history shows that companies issuing negative EPS guidance is well below the five-year average (80), while the number of companies issuing positive EPS guidance is well above the five-year average (28). 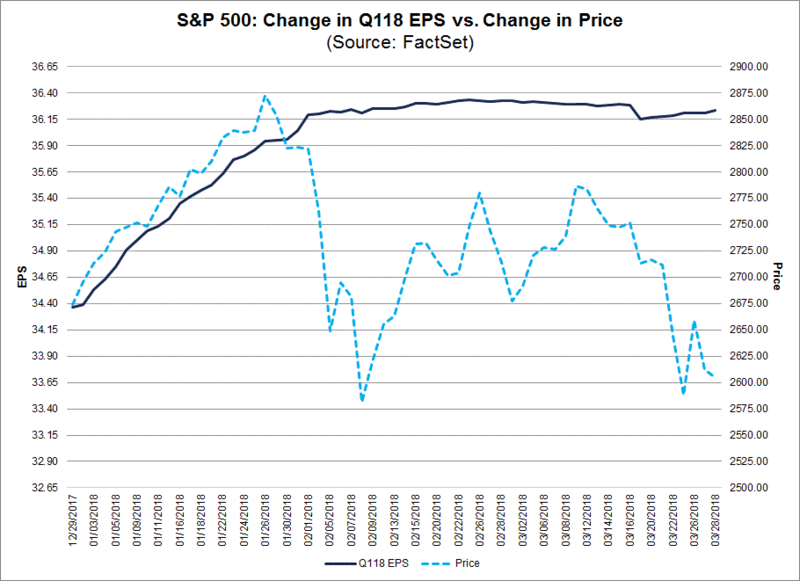 Historically, earnings expectations tens to decline as the quarter progresses. Analysts tend to over estimate initially, companies tend to lower guidance, so they ultimately beat guidance. It’s a bit a of a game in that regard. Nevertheless, this is the highest number of S&P 500 companies issuing positive EPS guidance for a quarter since FactSet began tracking this metric in 2006. The record for the number of S&P 500 companies issuing positive EPS guidance in a quarter is 47, which was set in Q2 2010. 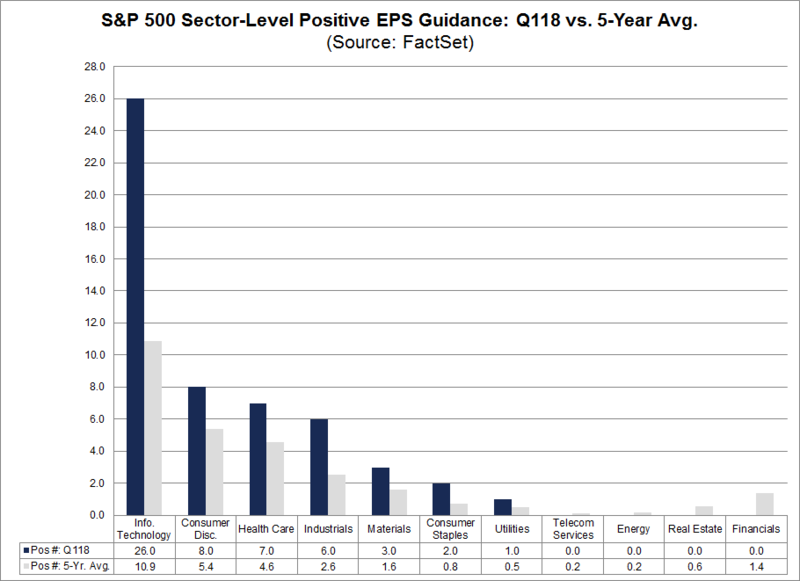 At the sector level, the Information Technology (38) and Consumer Discretionary (24) sectors have the highest number of companies issuing EPS guidance for the first quarter. This is not surprising, as these two sectors have historically had the highest number of companies providing quarterly EPS guidance on average. The number of companies issuing positive EPS guidance in the Information Technology sector for Q1 2018 is 26, which is well above the five-year average (11) for the sector. 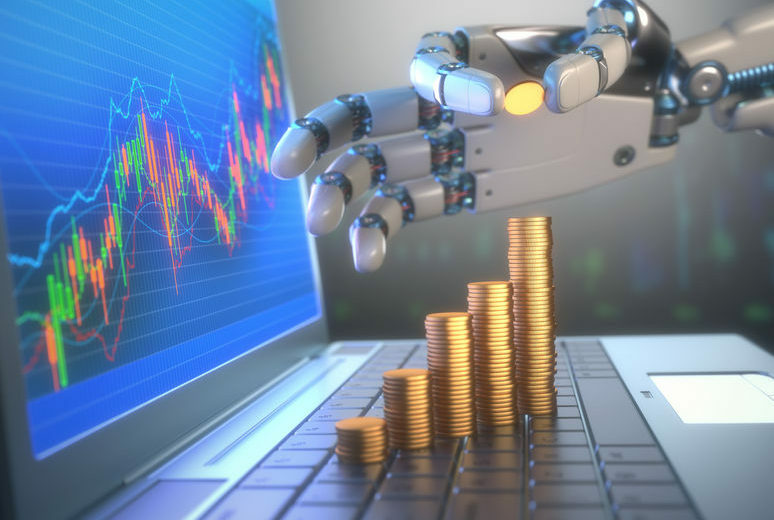 At the industry level, 15 of the 26 companies that have issued positive EPS guidance in the Information Technology sector are in the Software (8) or Semiconductor & Semiconductor Equipment (7) industries. Of the 26 companies in this sector that have issued positive EPS guidance, 21 have also issued positive revenue guidance. The key factor driving the increase in EPS guidance is obviously the lower corporate tax rate for 2018 due to the recently passed tax law. 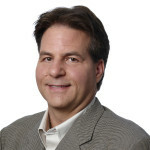 However, it is difficult to quantify the exact impact of the changes in the tax rate on the upward revisions. Other factors also have fueled the increase in earnings estimates as well. For example, rising oil prices have likely contributed to the large increase in earnings estimates for companies in the Energy sector. Expectations for higher interest rates in 2018 have also likely contributed to the significant increase in earnings estimates for companies in the Financials sector. We will see the first part of the banks report later this week. At the sector level, 10 of the 11 sectors have recorded an increase in their bottom-up EPS estimates for 2018 during this window, led by the Energy sector (+18.0%), Telecom Services (+15.3%), Industrials (+10.2%), and Financials (+9.9%) sectors. Market expectations are high for earnings, how the market responds in the next few weeks will likely set the tone for the next few quarters. Earnings should be good enough to stabilize the markets, but as we get closer to recession and an inverted yield curve in 2019 and beyond, rising rate are not good for earnings or the markets. Our upcoming seminar series is underway. 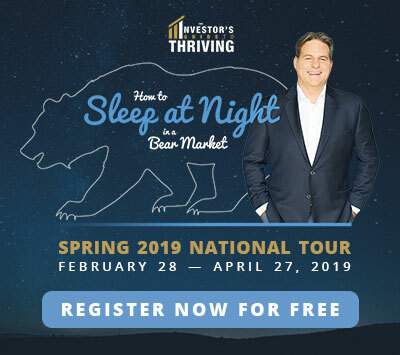 Come out to one of the events and learn about what ETFs can help your portfolio with the uncertain economic backdrop over the next few years. Register free by clicking here. We ask BNN Viewers to make a voluntary charity donation to support Alzheimer’s research at Baycrest Hospital or Cancer research at the Hospital for Sick Children.